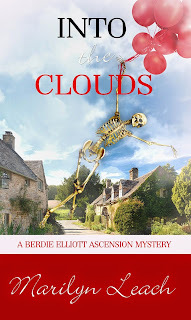 Ascension Sunday balloons are not the only things disappearing in the English village of Aidan Kirkwood. When the villagers celebrate the first Ascension Sunday Processional in fifty years, someone goes missing. A well-off widow who was amongst the crowd has vanished into thin air. And she's not the only one who's nowhere to be found. Berdie Elliott, the local vicar's wife, goes into sleuth mode as eccentric cat lovers, a secretive informant, Portuguese holidays, an enigmatic "tree" house, and tangled family dynamics all add to the perplexing affair. "What on earth is he talking about?" ...and so I used the handy dandy dictionary tool available on my Kindle. Turns out Whitsum is actually Pentecost, as used in British English. Brilliant! As ever, I loved the setting, and I followed along with the characters and the mystery quite avidly. I will say that in terms of the more minor characters, I felt like there were a lot of them in this book and I had a difficult time keeping them straight. That's the one thing on my Kindle that I still struggle with. I don't find it as easy to flip back and forth between portions of the book to refresh my memory. I also found the plot in this book a bit more convoluted as compared to other volumes in the series. There were two mysteries, really, and we had Berdie pursing one and her best pal Lillie pursuing the other, and I didn't find Lillie's quick jump onto that mystery, and her subsequent unexpected and unexplained trip to Portugal in that regard, all that believable. That plot point, tying into a disagreement she is having with her beau, seemed a bit contrived to me. Those points notwithstanding, I enjoyed this book. I like the characters, I'm very happy checking back in with them to see what has happened in their lives, and I adore sinking into their beautiful village setting. This book came out in the fall of 2014, and I'm hoping that the author is planning to keep writing new adventures in this series. Has anybody else read this book or others in the series? What did you think?